I actually have never been to a B&B. And really home that my husband can come to yours someday soon. Thanks for all the info you are sharing with us. Thanks for your comment. 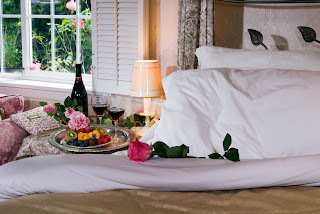 We would be honored to have your first stay at a b&b with us! Keep watching our posts on Facebook and hopefully we'll be able to answer any questions or apprehensions you or your husband might have! It's hard to chose a "best part" for your B&B, Diane, but if my arm were twisted just a tiny bit, I'd say the "at your door" breakfast delivery is the tops! No getting presentable to talk to strangers, no chatter before coffee, bathrobes on the deck - couldn't ask for better! I agree with you Shirley. I truly love delivering breakfast to our guest's door! The many years I traveled for both work and pleasure, one of my favorite things was room service. I always felt pampered and special. I want all of our guests to feel that way too! Thanks for the wonderful review!! How cool is it that it's showing on the same page as your comment!